Multi level marketing was developed years ago by ingenious salesmen and women who had a product they wanted to sell to more rural markets. The company would seek “investors” who purchased a number of these products and then went door to door in smaller markets selling the product they’d purchased for a profit. Say the product was vacuums, the salesman would purchase a number of these appliances for a discounted price and then make back their money by selling the vacuums to those in areas where stores were hard to come across. This made it easy for people to get the products they needed without having to drive miles out of their way. Today, the internet has made it easy for anyone to get the products they need from the comfort of their own home. Comparison shopping is easy to do, and this makes it easy for all purchasers to get a decent price on items. MLM today is generally a scam or pyramid scheme. In many cases, people are promised large amounts of wealth for investing into a new company or by purchasing products for more than they are worth and then having to turn around and try to find buyers. Because most of these programs turn out to be scams, credit card processing companies are extremely hesitant to provide processing to these firms. According to United States statistics, only 2% of those who become involved in this type of business actually turn a profit. This should clearly demonstrate just how risky this type of business is. Those who are successful are then liable for fraud investigations by the government and agencies like the Better Business Bureau. Your best bet is to steer clear of any MLM business, but there are those rare cases when a business is legit. Before joining these businesses, head to the Better Business Bureau and verify they are a responsible business with no major complaints registered against them. $200 to $1,000 in start-up fees. 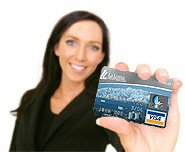 This covers installing the equipment or programs that will process the credit card information. 2.5 to 5% surcharges for the total amount of each credit card transaction. Fees of 25 cents to $2 each time you swipe or run a credit card number. Charge back fees of up to $60 each occurrence. Too many charge backs can result in your company losing the ability to process credit cards, debit cards, or electronic checks. $5 to $10 monthly statement fees. This fee is charged so that you receive a monthly printout of your business transactions for your records. 10 to 40% of your monthly revenue must be deposited into an escrow account to cover charge back amounts. Given these hefty fees, you might be paying upwards of $500 a month in processing fees, plus another $4,000 in escrow deposits, your payment to be hooked up to their credit card processing server, and the fees required for each credit card transaction. Your monthly income of $10,000 can quickly reduce to just a few thousand dollars after fees, taxes, and escrow payments. You must plan accordingly and make sure your business will be turning a profit and not driving you into debt. Apply Now with Aplus and Avoid Hefty Merchant Account Fees for your Multi-Level Marketing Company.